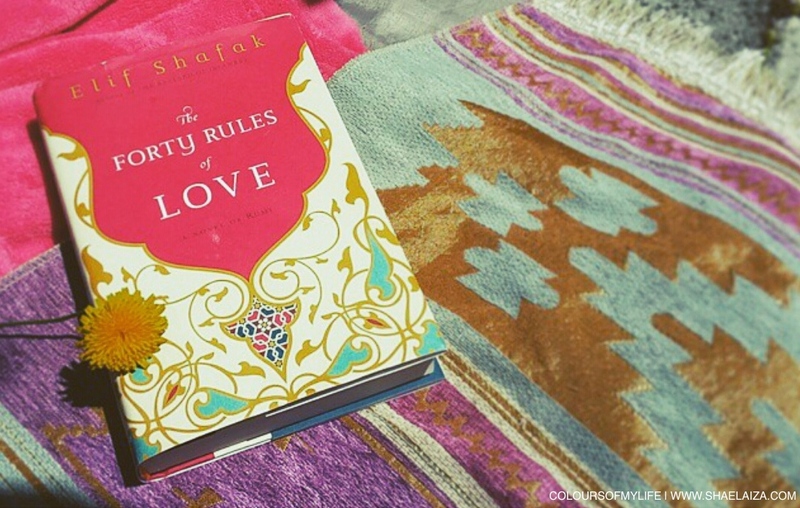 My friend Chloe lent me a wonderful book called The Forty Rules of Love: A Novel of Rumi written by Elif Shafak. Jalaludin Rumi has increasingly become one of my go-to sources of inspiration over the last few years and this has been particularly uplifting because I have struggled with some Muslims who can be harsh and sanctimonious. Additionally, as a Muslim woman I'm often exposed to personal attacks about my faith by people who don't understand it or even know who I am. It is a challenge to balance or to have harmony in my desire to have compassion for myself and for those who are ignorant, misinformed or sometimes downright judgemental. This book has helped me to revive my love for life, my faith and myself and I am here to share how it helped me to love again. Once you have tasted the sweetness of this love it is easier for kindness and compassion for oneself and others to ensue. In The Forty Rules of Love, we are introduced to two narratives that have been juxtaposed to concurrently unfold into one enlightening and thought-provoking book in which forty inspiring rules of love are embedded for the reader to look forward to with the turn of every page. One story is about Ella, a Martha Stewart-like middle-aged Jewish woman who finds herself in a lifeless and loveless marriage and yearned to find her identity again in 2008 through a newly acquired job as a book script editor. The more substantial story within the book is one about the life of Mawlana Jalaludin Rumi, a prominent 13th Century Islamic jurist and theologian who resided in Konya, Anatolia which is now known as Turkey and how he met his companion and soulmate, Shams Tabrizi, a travelling dervish, poet and philosopher from Tabriz in modern-day Iran. The Forty Rules of Love also uncovers how Ella comes across a man who caught her interest and made her wonder if he was her soulmate or not. Despite being two different stories set centuries apart they intertwine beautifully to show us that opposites have a way of revealing things that we may not have been able to see when they stand on their own. The same can be said about Rumi and Shams. The two men couldn’t be anymore different. On one hand, Rumi was a well-respected scholar whose sermons attracted thousands of attendees every time. He was born into an aristocratic family in Khorasan, present-day Afghanistan but his family fled from their homeland when the Mongols invaded it. On the other hand, Shams was said to be the son of an imam in Tabriz who wanted him to grow up and be a simple man. Shams' father did not believe his confessions about receiving mystic visions since he was a young child and this led him to feel quite estranged from his parents. Shams studied the Shafi’e jurisprudence extensively in his hometown but at one stage he decided to be a travelling dervish and earned a living by working as a weaver and embroiderer wherever he travelled to. Mawlana Jalaludin Rumi the scholar in the ivory tower and Shams Tabrizi the spiritual, free-spirited artist were two sides of the same coin and when they met their lives changed forever; Rumi learned how to love God in a way he never did before and Shams began to feel like he was fulfilling his destiny by being a spiritual guide to Rumi because he knew Rumi was destined to teach people to be transcendent in their love for God for many centuries to come. What I enjoyed about this book is learning about Rumi and Sham’s journey as individuals and companions. I also liked the way it challenged me to look at people and situations with a different perspective. For instance, even though Rumi was quite happily married he still felt like he had not met his soulmate. It made me realize that a soulmate (or love) can come in various forms. Another is in the account written about Desert Rose, a woman who was forced into a life of prostitution but strongly desired to free herself from it and seek God. One day, she sneaked out of the brothel to attend one of Rumi’s sermons only to be taunted by a police officer who had recognised her and managed to rally a crowd of other people there to drive her out of the mosque before Shams Tabriz came to save the day. Shams is quite the superhero figure as he often comes to the rescue when those who are often looked down upon in society are mistreated. He once visited the brothel to check on Desert Rose’s well-being and when confronted by a harlot he defended Desert Rose’s pure intentions. If you are not familiar with Rumi you may be quick to dismiss his work because you might feel uncomfortable about a Muslim scholar who appeared to write endearingly about wine and intoxication in his poems. The “wine” that Rumi spoke of is about a love for Allah that allows us to transcend our ego, the nafs, which is the part of us that goes, “Me, me, me!” or “Look at me! Listen to me! Obey me!”. When our hearts have been neglected or misguided we begin to worship ourselves or more accurately, our hedonistic and carnal desires. Ideally, our hearts should be so attached and enamoured by our love for God that everything we do is with God-consciousness. This is not to say we should completely abandon all worldly pursuits and start neglecting our wants and needs. Islam that is practiced with ehsan (excellence) will ultimately result in a balanced and healthy human being who leads a fulfilling and meaningful life. We may not understand God’s plans for us sometimes and why we are blessed with certain gifts or why we have to endure certain challenges but it is important to remember that everything has its time and purpose. The way He responds to our prayers, whether hastens or delays, it is not to make us feel proud or despair, but to remind us that ultimately, we were created to love and serve Him and His creations in the best ways possible. So if He tests you with with loss and pain remember that they are from the one Who loves us more than our own mothers do: Allah who is ar-Rahman (the Lord of Mercy) and ar-Raheem (the Giver of Mercy). When I learned to increase my good opinion of Allah I began to remember what it meant to love Him sincerely. What a wonderfully written piece. As a lover of Rumi I felt a connection with what you have written. Thanks for it. I only wish that you will update your blog more often. @alwaysamusafir: Thanks for reading my blog post and the feedback :) I wish I could update my blog more often too! It's hard to choose what to write about these days because there's a lot going on. I'm also trying to be more intentional with my writings. InshaaAllah khayr. I'll do my best.